A black and white print of Albert Wilson Jackson. Albert Wilson Jackson was born in Wicklow County, Ireland on June 11, 1870. He immigrated to Canada in 1871. His family operated a store at Port Whitby. Albert and his brother Tom operated a steamboat service in the 1890s and early 1900s. 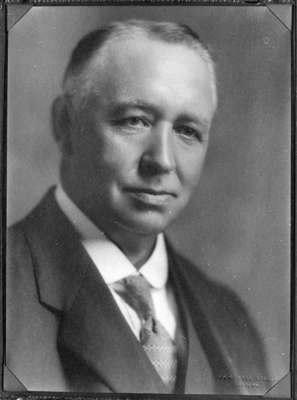 Mr. Jackson was a member of the Whitby Board of Education from 1901 to 1904, a member of the Town Council from 1905-1906. He was Mayor from 1907-1908 and and 1936-1937. He was Reeve of the Town of Whitby from 1909-1912, 1925-1928, 1930-1935, 1938-1939. He was collector of customs at Port Whitby from 1912-1921. He was a member of the Board of Education in 1916-1917, and Clerk-Treasurer of the Town of Whitby from 1921-1923. In 1927, he was Warden of Ontario County. Mr. Jackson was largely responsible for bringing the Ontario Hospital to Whitby in 1912, and was active in planning the addition to the courthouse in 1910. He died at Whitby on April 10, 1939 and is buried at Mount Lawn Cemetery, Whitby. Albert Wilson Jackson, c.1927, Campbell Studio. Whitby Archives 31-002-019.